ICCF is continuously pursuing new ways to create housing opportunities and programs that serve our communities and respond to God’s call to justice. ICCF often works to take forgotten spaces and turn them back into beautiful places in their communities. ICCF is currently working on several developments throughout the Grand Rapids area which will bring beautiful and affordable homes to local families. ICCF is adding 65 mixed income housing units to the Baxter and Madison neighborhoods at 501 Eastern. Currently three dilapidated buildings and five empty lots occupy the space. This new development, which includes a community room, exercise room, and kids’ room, will add vibrancy and density to a community facing an affordable housing shortage and rising rents. Construction will begin in fall 2018. 17 units are designated for formerly homeless youth. Bethany Christian Services will again offer supportive services to these residents. ICCF is now planning for the redevelopment of the former Grand Rapids Christian High School building at 415 Franklin in partnership with Madison Square Church: Ford Campus. The first floor will include worship and activity space for the church as well as a nonprofit office. The second and third floors will be repurposed as residential, providing 40 affordable apartments funded primarily through Low Income Housing Tax Credits. Construction is expected to begin in the summer of 2019. ICCF will begin construction on new affordable housing on the west side in fall 2018 to ensure low income households and families continue to have a place in this community. The five story development will have 64 units– 51 affordable units and 13 market rate units. Commercial bays owned and operated by Rockford Development will occupy the ground floor. Stockbridge residents will have access to a community room, exercise room, and kids’ room on the first floor as well. Estimated completion date for this project is fall 2019. 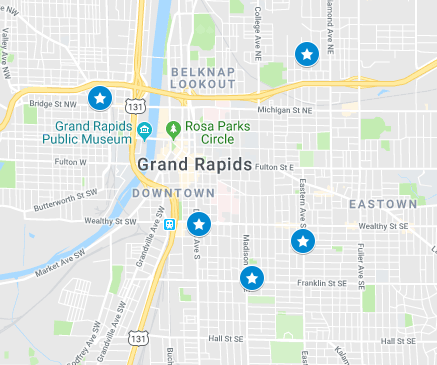 For over 3 decades, ICCF has been committed to the revitalization of a 4-block area of southeast Grand Rapids with boundaries of Wealthy, Division, Buckley, and La Grave. ICCF refers to this area of our community as Tapestry Square. Community conversations, resident outreach, neighborhood meetings, charrettes, formal plans, and advocacy for the redevelopment of this area have been ongoing since the 1990s. After many successful developments in this area, ICCF has recently announced its plan to develop a mixed-use, mixed-income senior living facility at 424 South Division. Tapestry Square Senior Living is the proposed development of a 7-story independent senior living facility that would comprise of 84 housing units, 50 of which would be reserved as affordable housing units. This proposed development is in the early stages of planning, with ICCF applying for Low Income Housing Tax Credits in October 2018.